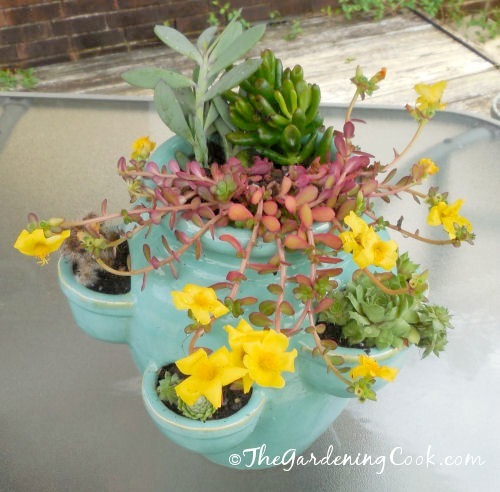 This DIY Succulent Strawberry Planter is a great way to display a variety of succulents in one planter so that each plant has its own special space. 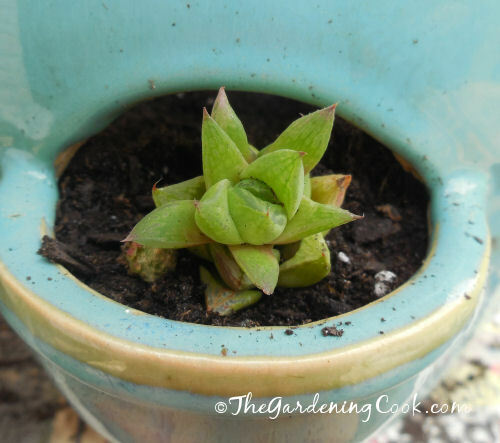 If you love succulents as much as I do, you will want to check out my guide for buying succulents. It tells what to look for, what to avoid and where to find succulent plants for sale. I love strawberry planters. The pockets on the side are perfect for plants that send out offshoots. 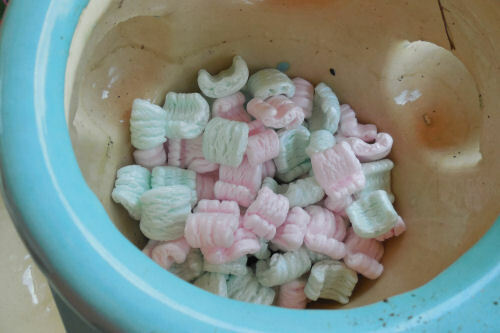 Each little “baby” can fit into the protruding pockets to make their own little home. They are perfect for strawberry plants (of course! ), spider plants and other plants like strawberry begonias. Today I am converting mine into a succulent strawberry planter. 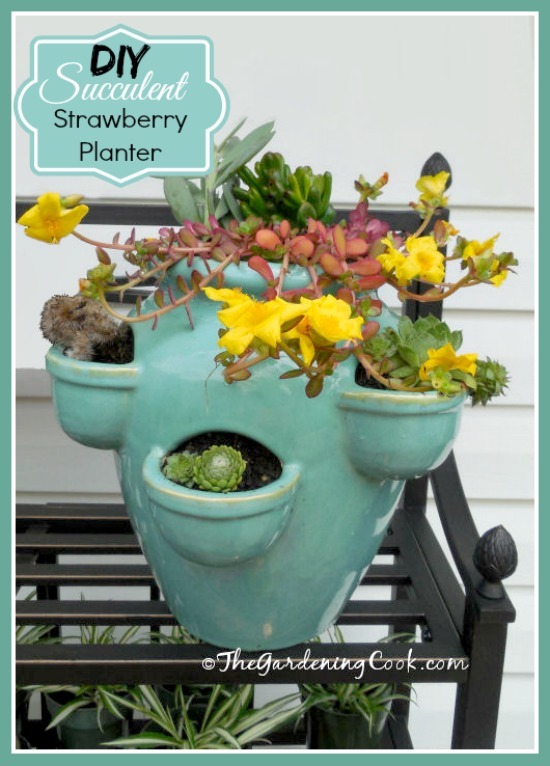 Make your own Succulent Strawberry Planter. I assembled my plants. 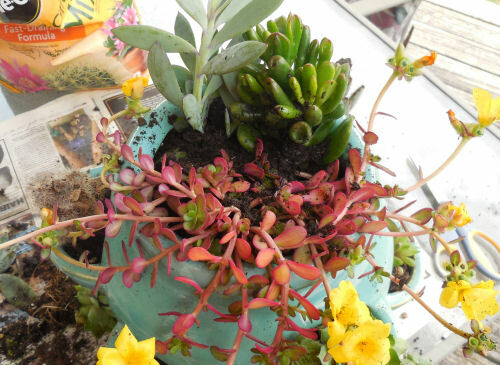 I chose crassula, several sempervivum (hens and chicks), a fishhook Senecio succulent, a Stenocereus Hollianus Cristadacactus cactus and Purslane Summer Joy yellow (it does cascade), as well as a thin leaved jade plant for a bit of height. The plants came from a few new purchases as well as an old planter that had seen its better days. 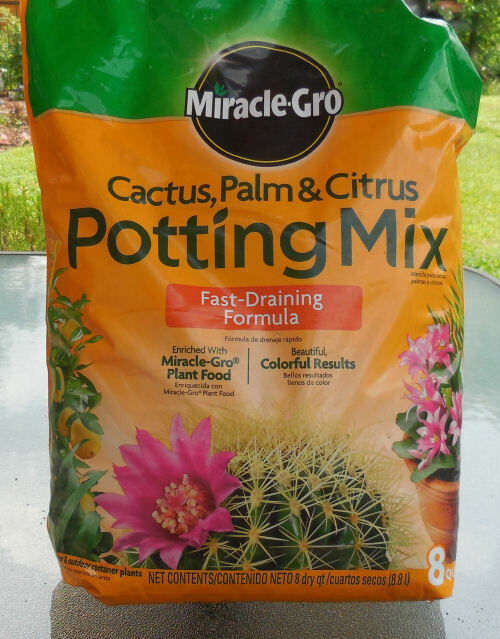 Miracle Grow Cactus, Palm and Citrus Potting mix is my soil choice. 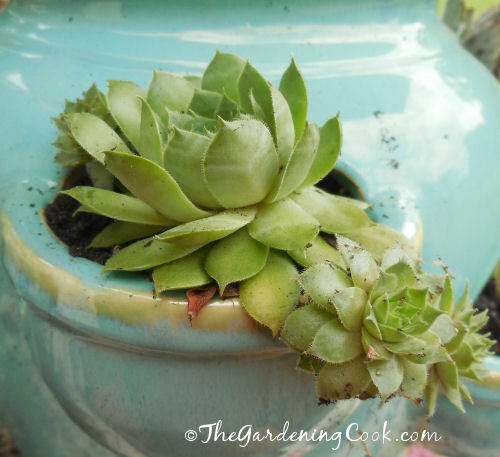 It drains well and is a perfect choice for succulents that don’t like wet feet. If you can’t find it locally, it’s available from our Amazon.com. The first thing I did was to put rocks in the bottom of my planter. There was a drainage hole there but with succulents, I wanted to make sure that the soil drains really well. Next step was something that I do in all of my heavy pots. I added several inches of packing peanuts. 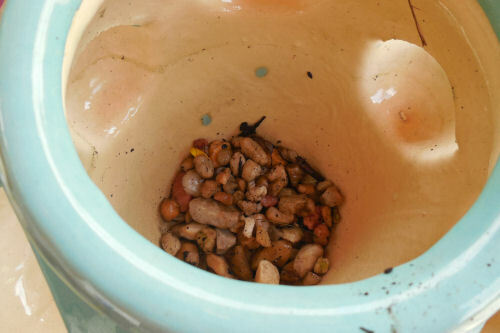 The peanuts mean that you have less soil (which saves money) and also means that the planter will be lighter to move around – a real plus with heavy planters. 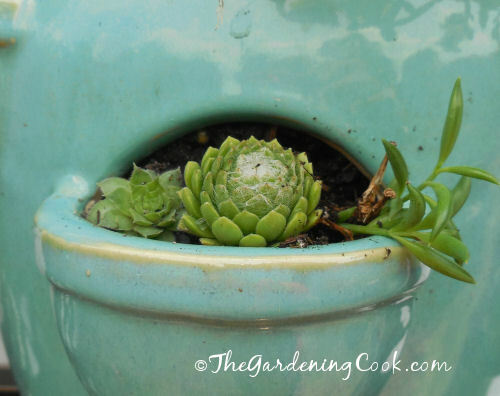 The first pocket has some hens and chicks (sempervivum) as well as a piece of a fish hooks senecio. The latter will trail down a little over the side. 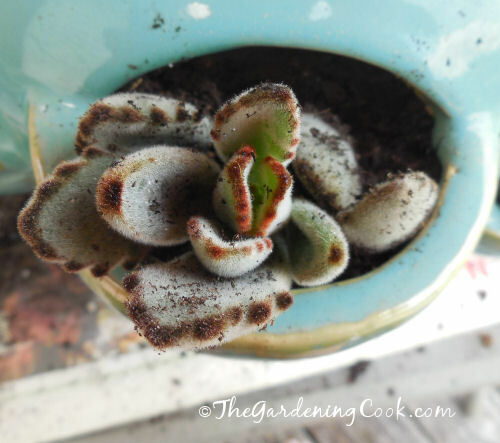 This Kalanchoe Tomentosa is also known as Donkey’s ears. I love the fuzzy outside of the leaves. It is easy to see where it got its common name! This sempervivum, hens and chicks, has some babies that are now growing over the side of the pocket. Sempervivum is also somewhat cold hardy too. This pocket holds a Haworthia cuspidata. I love the rosette shape of the plant! This little cactus is just covered with spikes but loves his new home. The name of this cactus is Stenocereus Hollianus Cristada. He is supposed to be green, and I don’t know if he’ll revert back to his original color or not but I like the brownish color against my planter color anyway. 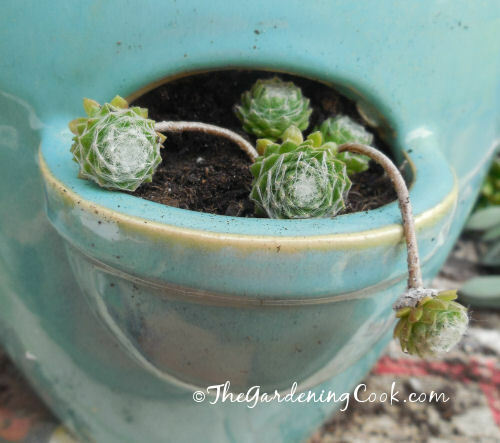 These baby sempervivum, hens and chicks got very spindly in the last planter but look great over the edge of the pocket of this one. 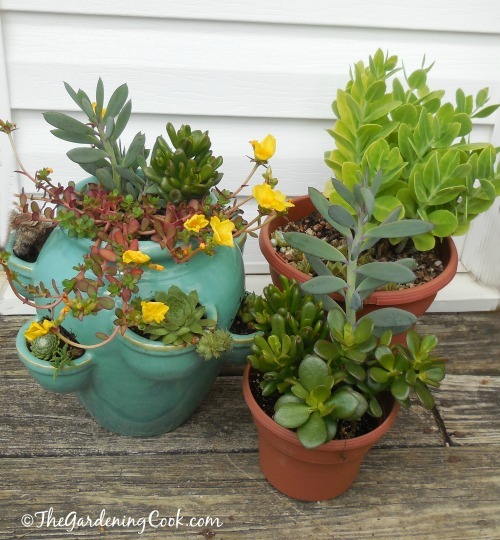 Purslane, Summer Joy Yellow, Crassula and a thin leaved jade plant are perfect for the top. They give both a cascading effect and the height that the planter needs. This is the finished planter. It has both side interest, trailing interest and height on the top. I love the way it all came together. I have it sitting in a grouping of other succulents in a perfect spot on our deck. These planters sit right underneath my white birdcage planter that has both upright and trailing vinca in it. When I water the birdcage planter, the residue drips down to the planters below giving them just enough moisture, so I never even have to water them! And now, if I can just find some strings of pearls succulents and burros tail succulents, I’ll be a happy girl. They will get added later to accent two of the pockets. Hello! I just moved my “healing” chicks and hens into their strawberry pot after being rescued from a family member leaving them to die, so im so scared of under/watering. Any tips on how to evenly water succulents in a starwberry pot? Thank you!! Hi Kayla. A strawberry planter has challenges for succulents since it has a large portion of soil in the center with no plants in it. I’d treat each section on its own when deciding whether to water. Hens and chicks are very forgiving plants. I’d err on the side of underwatering. 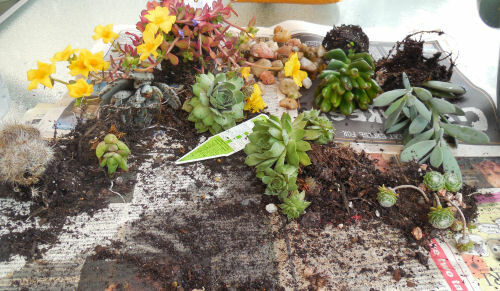 Allow the soil in each section to feel quite dry before you water again and water from the side sections individually. 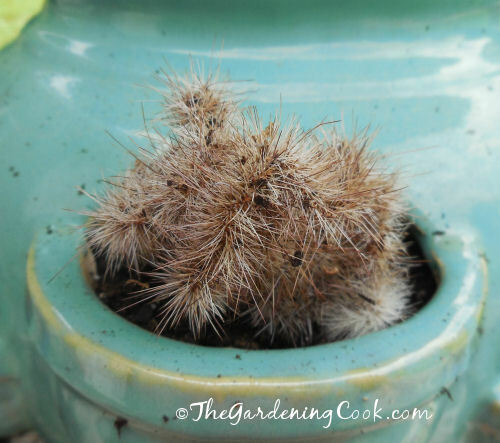 Then just add a bit of water to the top area but don’t try to get all the inner soil wet.